Information Minister Dr Hasan Mahmud has outlined the priorities of his ministry in the new government saying overall welfare of journalists and ensuring media independence would the key objectives of his office. The minister made the statement while attending A ‘Meet the Reporters’ session at Sagar-Runi Auditorium of Dhaka Reporters Unity (DRU) today. 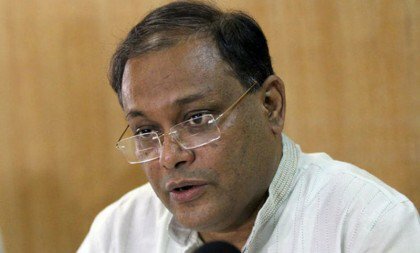 He said: "Awami League’s election manifesto pledged to arrange accommodation facilities for the journalists and we will do it [as well]." Hasan said his ministry laid priority on finalizing a policy for online media to ensure responsible journalism. The minister said works were underway to implement the 9th Wage Board for newspapers and news agencies but some more steps would require to be exhausted for declaring the wage hike of the journalists and newspaper employees. Hasan said a cabinet committee was earlier formed as part of the process to implement the Wage Board recommendations but with the installation of the new government that committee was now required to be reconstituted with Prime Minister Sheikh Hasina’s directives. “The new cabinet committee would discuss the matter then we will talk to your journalist community leaders possibly on January 23 and thereafter talks will be held with other stakeholders,” he said. The minister also said the wage board award should accommodate as well the electronic media with emergence of a number of private TV channels in recent years while previously only the state-run BTV was there. Hasan said his ministry would work for Media Employees (Condition of Services) Act and assured the journalists to look into their concerns regarding the ‘Digital Security Act’.